Miss Araminta Galsworthy travels to the home of her new guardian, Baron Julian Rochefort, an inventor like her father, only to find herself hastily married, shot at, and attacked by evangelicals who consider her husband's airship the work of the devil. She is also expected to play hostess to a bevy of guests, all of whom seem to be engaged in treason. Their intent: restore the monarchy. A shocking concept to Minta, who was only ten when the Duke of Wellington seized the government. Lord Rochefort's enemies are legion: rival aeronauts from the continent, rival monarchists who want to place the Duke of Cumberland on the throne (or possibly the Duke of Cambridge). And a wily Wellington, who has allowed an already autocratic nature to grow into despotism over the course of his reign. Minta struggles to adjust to new friends, new enemies, a new husband. To the concept of being an integral part of a revolution. Not easy for a girl just shy of her majority. But she finds her way past all obstacles, to become an important part of the great day when Lord Rochefort sets down Aurora, the world's first airship, in Hyde Park. All does not go as planned, however, and Minta almost loses her chance to live a life where she, not Aurora, is the center of her husband's universe. 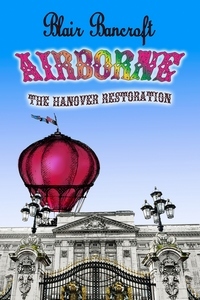 A Note from Blair: Airborne - The Hanover Restoration is a Steampunk "What if." A tale, suitable for all ages, of how the Steampunk Era might have begun. It is also an Alternative History, set in 1840, of what might have happened if the war hero, the Duke of Wellington, ousted the free-spending dilettante, George IV, and became Lord Protector of the British Empire.